My first attempt at a script font. Did you know that out of over 4000 fontstructions, there are only 40 in the category at this time? That's like 1%. Here's to increasing the percentage. Hopefully I'll be able to do an uppercase. Info: Created on 19th December 2008 . Last edited on 19th June 2009. Hah! Somehow you've managed to prove and disprove that phrase all at once. Good point. The ones on offer are pretty intimidating, however. Thalamic's in particular. yeah, make me think of "ceci n'est pas une pipe" of duchamps. 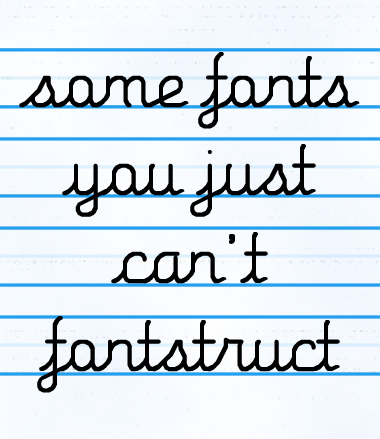 @Stewf: I'm working on a newer phrase that goes something like this> "Some fonts you can only FontStruct." It seems to be more empowering for my favorite software app. @intaglio: The script fonts are truly inspiring. I just saw thalamic's new hello. He makes it look sooooo easy! @cam.ill: "Ceci n'est pas une fontstruction." René Magritte is my all-time favorite surrealist painter.